Gudfeite von New=York und Brooflyn mit der projeftirten Rettenbrude. 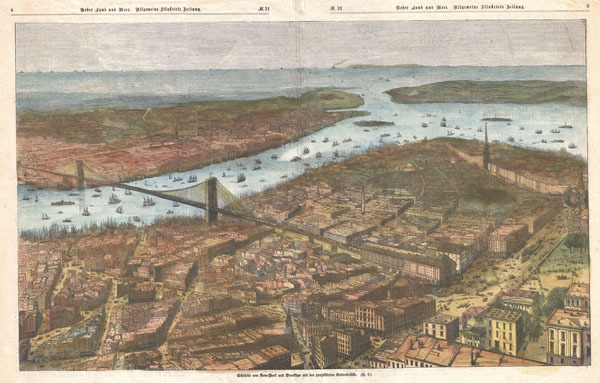 This is an unusual c. 1883 view of New York City looking south from the Soho area towards Brooklyn, the Brooklyn Bridge, Staten Island, the East River, and New York Harbor. Numerous ships sail on the East River as it flows under the Brooklyn Bridge into New York Harbor. Published in the German newspaper Allgemeine illustrirte Zeitung to illustrate the opening of the Brooklyn Bridge in 1883. Very good condition. A couple of minor verso repairs. Original centerfold.